ww2dbaseJürgen Georg von Bismarck was born in Neumühl near Königsberg in der Neumark, Germany. On 13 Jun 1910, he joined the German military and served with a battalion based in Silesia, with which he fought in WW1, emerging a company commander. After the war, he remained with the post-WW1 German military, Reichswehr, serving in infantry, cavalry, and motorized units. In late 1938, he became the commanding officer of the 7th Infantry Regiment, and participated in the invasions of Poland and France in that role. For his performance in the French campaign, he was awarded the Knight's Cross the Iron Cross on 30 Sep 1940. 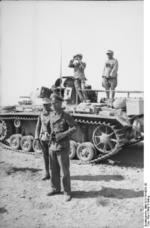 In May 1942, he arrived in North Africa as a staff officer in Panzer Group Africa. During the Battle of Alam el Halfa near El Alamein, Egypt on 31 Aug 1942, he was killed in action by Allied mortar fire while leading troops from the front lines. He was posthumously promoted to the rank of Generalleutnant. 15 Feb 1891 Georg von Bismarck was born in Neumühl, Germany. 13 Jun 1910 Georg von Bismarck joined the German Army and was given the rank of Fahnenjunker. 20 Mar 1911 Georg von Bismarck was promoted to the rank of Fähnrich. 18 Nov 1911 Georg von Bismarck was promoted to the rank of Leutnant. 27 Jan 1917 Georg von Bismarck was promoted to the rank of Oberleutnant. 10 Jan 1919 Georg von Bismarck became a member of the Reichswehr as a member of the 16th Infantry Regiment. 10 Jan 1920 Georg von Bismarck was transferred to the German 5th Infantry Regiment. 1 Oct 1921 Georg von Bismarck was transferred to the German 3rd Cavalry Regiment. 10 Jan 1923 Georg von Bismarck was transferred to the German 5th Infantry Regiment. 10 Jan 1924 Georg von Bismarck joined the German 5th Prussian Infantry Regiment as the commanding officer of a motorized company. 1 May 1924 Georg von Bismarck was promoted to the rank of Hauptmann. 1 Jan 1934 Georg von Bismarck was promoted to the rank of Major. 1 Oct 1934 Georg von Bismarck became the commanding officer of a motorized reconnissance unit. 1 Aug 1936 Georg von Bismarck was promoted to the rank of Oberstleutnant. 10 Nov 1938 Georg von Bismarck became the commanding officer of the 7th Infantry Regiment in Gera, Germany. 1 Feb 1939 Georg von Bismarck was promoted to the rank of Oberst. 20 Sep 1939 Georg von Bismarck was awarded the Iron Cross 2nd Class. 1 Oct 1939 Georg von Bismarck was awarded the Iron Cross 1st Class. 30 Sep 1940 Georg von Bismarck was awarded the Knight's Cross of the Iron Cross. 10 Dec 1940 Georg von Bismarck was named the commanding officer of the 20th Rifle Brigade. 9 Oct 1941 Georg von Bismarck was named the commanding officer of the 20th Panzer Division. 5 Jan 1942 Georg von Bismarck was assigned as as a staff officer of Panzer Group Africa. 11 Feb 1942 Georg von Bismarck became the deputy commander of the 21st Panzer Division. 19 Feb 1942 Georg von Bismarck was promoted to the rank of Generalmajor. 1 Apr 1942 Georg von Bismarck became the commanding officer of the 21st Panzer Division. 31 Aug 1942 Georg von Bismarck was killed by mortar fire during the Battle of Alam el Halfa. 16 Nov 1942 Georg von Bismarck was promoted to the rank of Generalleutnant posthumously.